Donald Trump is still breathing, so of course he is engaged in yet another petty argument that only bolsters the case that he’s an animatronic buffoon in an expensive suit and oversized veneers. 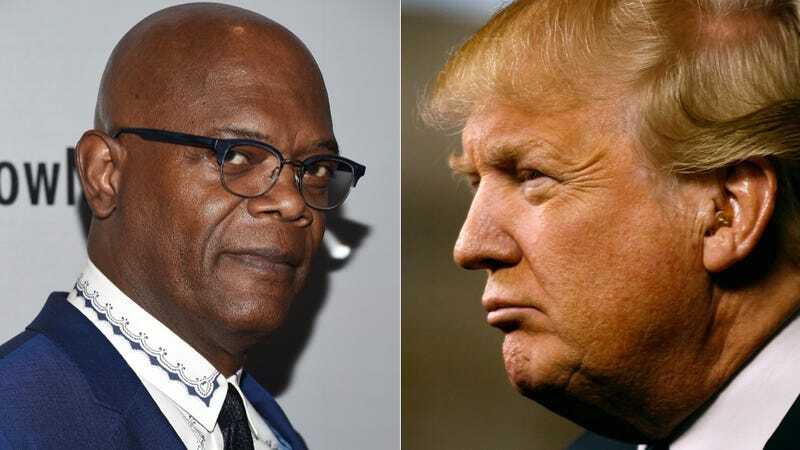 This time, he’s going against Samuel L. Jackson. Now, to be fair, it was Jackson who threw the first punch in this particular dudefight, but you can’t reasonably blame him for that. Somehow Donald Trump came up during an interview in the January issue of United’s in-flight magazine, Rhapsody, of all places. OHHHH SNAP. Does it surprise anyone to learn that Donald Trump cheats at golf? He’s more or less cheated his way to fame and fortune, and on his first wife. What’s a game of golf? Apparently Donald Trump cheating at golf is already A Thing. The Washington Post even tracked down a substantial list of people who confirmed that yes, he constantly cheats at golf because the security of his manhood is entirely dependent upon winning a leisurely recreation involving tiny white balls. Let’s just assume that these two definitely did play golf—two incredibly rich and famous men playing golf together is highly plausible occurrence, after all. And why would Samuel L. Jackson make that up? Donald Trump is the loser here, but kudos to him for not reverting to what seems like the only tool in his arsenal: calling someone else a loser.